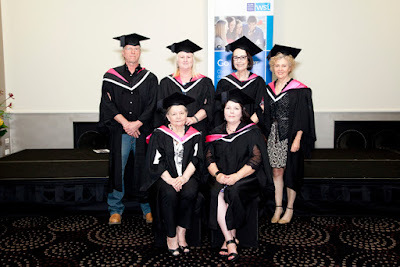 NADC is so proud of our first graduates of the Bachelor of Visual Arts program, which we deliver here at Western Sydney Institute in partnership with Federation University Australia. This vibrant program is building outstanding artists, who have chosen our degree to further their skills and knowledge and professionalise their practice in the environment they so value here at TAFE- one of small class sizes, nurturing and supportive staff, and dynamic teaching and learning in a practice-led environment. graduates. Her speech is reproduced below, and gives a wonderful snapshot of the BVA at Nepean Arts and Design Centre. Good afternoon distinguished guests, graduates, families and friends. It is my privilege to be addressing you on behalf of the students who undertook the inaugural Bachelor of Visual Arts through Federation University at the Nepean Arts and Design Centre at Western Sydney Institute of TAFE. 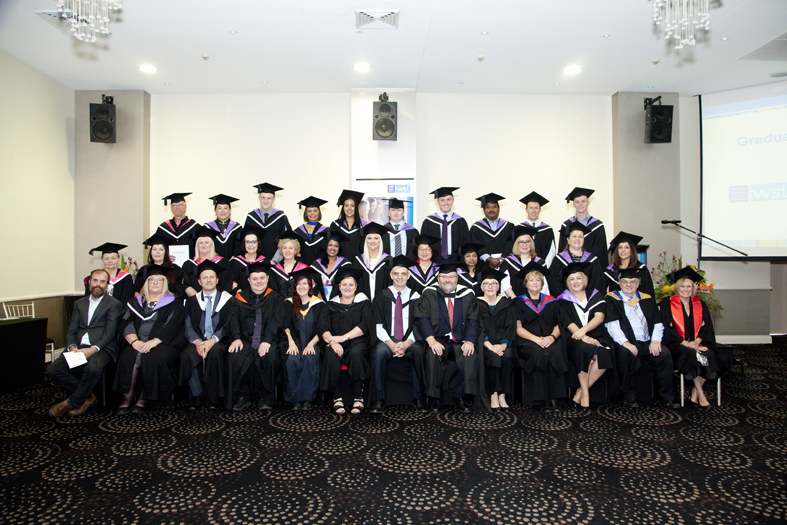 Fifteen graduates of the Advanced Diploma of Fine Arts from several TAFE Institutes seized this exciting opportunity when it became available. Each week for eighteen months these students, whose ages span six decades, crossed the mountains eastwards from as far away as Lithgow, or left the city and set out westwards towards the mountains to meet the challenge of further study. The first regards the huge diversity of our group. Our diverse personalities were expressed in an array of visual language. We had painters in oil, acrylic, mixed media and watercolour, working in representational language and abstract. There were printmakers in lino, etching and monotype and sculptors of clay, paper mache and automated, complex paper models. Others found expression in collage, charcoal drawing and screen animation, or installation incorporating weaving, assemblage and ceramics. At each point in our work we were challenged with the problems that accompany the perfecting of this expression, constantly attempting to bridge the gap between our inner vision and its final manifestation. The students in our group grappled with politics and the machinations of the world, personal stories, historical and scientific narratives, and imaginary tales for children. They worked through cultural and societal issues. They responded to architecture and nature, and sought connections between the past and present. Paul Cezanne has been attributed with saying: “The most seductive thing about art is the personality of the artist himself.” The great fortune in studying together was just this: having the opportunity to be seduced by each other’s work and learn from it. This process was particularly facilitated by our critical sessions guided by our Studio mentors where both the extrovert and the introvert were required to present their work in progress, inviting discussion with their peers. Indeed, during the course, many students endured illness and family trauma, juggled demanding work and family commitments, and faced the unexpected and challenging problems that life tosses along our way. Although it is a fact that we would never wish to encounter any of these problems, it is also apparent that they inform our work in the most profound and surprising ways and this is, paradoxically, one of the reasons I believe we find ourselves so relentlessly pursuing the path we have chosen in Visual Arts. My final observation relates to our teachers and mentors. They were the anchors who kept our rafts stable but who also challenged us to take risks and place ourselves where we often felt uncomfortable. They listened and helped us to realise our inner visions. I believe we could not have had finer teachers and mentors than we did and would like to thank wholeheartedly our Studio Practice advisors Cath Barcan, Di Holdsworth, Stephen Hall and Leo Robba, and theory teachers Dr Shirley Daborn and Stephen Hall. I would like to acknowledge as well, the huge contribution made by the Technical officers on our campus, and in particular Samara Kendall. We are also especially grateful for the support and feedback offered by Peter Pilven, the Visual Arts Program Leader, and Associate Professor Jennifer Jones-O’Neill, the History and Theory Coordinator from Federation University. Outside the context of our University exhibitions during our course, a number of students were selected as finalists into well -regarded art competitions such as Fisher’s Ghost, Blacktown City Art Prize, North Sydney Art Prize, Hornsby Art Prize, Hunter’s Hill Art Exhibition, and the Waverley Art Prize. Some won prizes along the way. Others were involved in group exhibitions. I believe that this Bachelor of Visual Arts degree has provided us with the confidence to put our boats out to sea. When we feel like clinging to the safety of the shore I would like to think that we can draw on our experiences during our time together on campus, remembering that it is vital to bond with other artists, be open to suggestions, to look up to those artists we admire and to continue to work amidst whatever conditions surround us. Graduate, Bachelor of Visual Arts,Western Sydney Institute in partnership with Federation University Australia. Five of our 2016 Bachelor of Visual Arts graduates: Karl Hellman, Barbara Hellman, Helen Brancatisano, Louise Holmes, Elaine Watson and Beverly Kirby. Such an incredible speech, an absolute privilege to have completed this degree along side you Helen.